From Highway 101, take the Highway 1 - Morro Bay Exit and bear to your right and proceed until you come to the first stoplight, which will be on Santa Rosa Street. Turn left at this stop light and proceed approximately one block up Santa Rosa Street where you will see on your right an office complex bearing the name MORGAN STANLEY, at 755 Santa Rosa Street. Turn right off Santa Rosa Street at Mill Street and right again into the parking lot. You will find plenty of free parking either under or behind the building. You will also find an elevator to take you to our office on the 3rd floor, Suite 310. 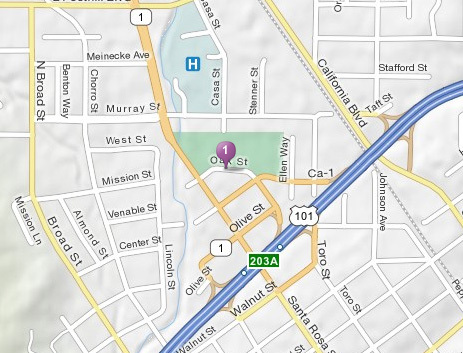 From Highway 101, take the Santa Rosa Street Exit to the first stoplight, which will be on Santa Rosa Street. Turn right at this stop light and proceed approximately three blocks up Santa Rosa Street where you will see on your right an office complex bearing the name MORGAN STANLEY, at 755 Santa Rosa Street. Turn right off Santa Rosa Street at Mill Street and right again into the parking lot. You will find plenty of free parking either under or behind the building. You will also find an elevator to take you to our office on the 3rd floor, Suite 310.